Snowball's Antarctic Adventure is packed with beautiful photographs and information about different types of Antarctic animals. Snowball explores Antarctica and comes across Chinstrap Penguins, Kelp Gulls, Minke Whales, Seals, Gentoo Penguins and Adelie Penguins. He also gives information about icebergs and weather in Antarctica. 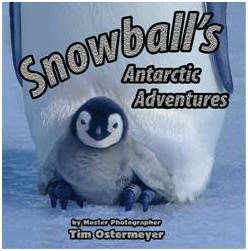 Mr. Ostermeyer does a great job of combining Snowball's adventure with information about Antarctica. The story text goes along well with his photographs, some of which are lovely close up shots of Snowball and his family. When it comes to the information pages however, there is too much text and information given on one page. It makes it seem more like a fact sheet on each animal than part of a story. I would have preferred for the animal facts to be laid out across a two page spread. This would have made the information more visually appealing and given each animal more page time. Snowball's Antarctic Adventure would work well for a read aloud, especially if the reader can find a way of incorporating the animal facts into the narrative rather than simply listing them. The amount of information included also makes it appropriate for independent readers as well. Overall, Snowball's Antarctic Adventure is a visually impressive book. It's worth buying simply for the photographs. The information gained from reading this book is icing on the cake.